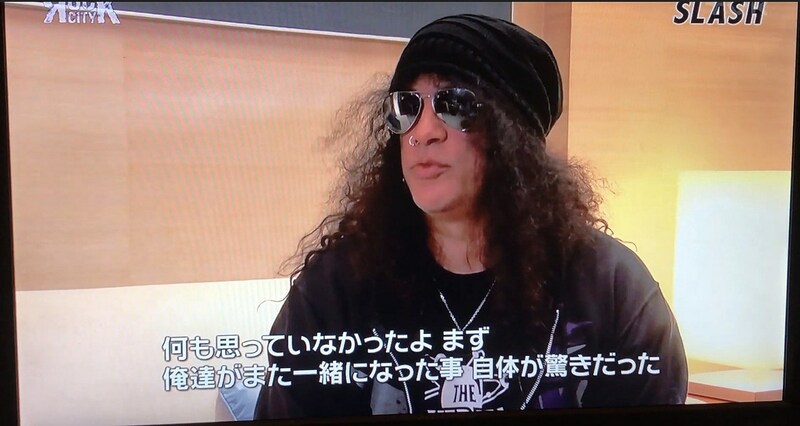 Slash talking GN’R new album on Japanese show TVK Rock City. The Guns N’ Roses reunion was more than just a 2017 tour – they are working on a new record, too. Kinda. As Stereogum points out, Slash confirmed in a Japanese video interview what GNR guitarist Richard Fortus told to The Saint Louis Dispatch: new music is in the works. “Axl, Duff, myself, and Richard have all talked about … there’s material and stuff going on already for a new record,” Slash told Japanese interview show TVK Rock City, of course with the usual caveats. “It’s just, with Guns N’ Roses, you don’t go, ‘Oh, there’s a plan, and it’s gonna be like this,’ because that’s not how it works. Basically, the only real answer to give is we’re hoping to put a new record out, and we’ll just see what happens when it happens.” Sounds like all fans need is a little patience. You can watch that video below. Fortus told the Dispatch, “Slash is on tour right now. Once he gets back from that, we’re gonna get some more recording done and hopefully get an album out soon. And then we’ll get back to touring.” We shall see on the touring front as well. That tour Slash is currently on is with backing band Myles Kennedy & The Conspirators and it hits North America this summer, including a NYC-area show at Port Chester’s Capitol Theatre on July 31 (tickets).